According to the CoinDesk Bitcoin Price Index (which goes by Greenwich Mean Time), the last day of trading has seen a low of $355.81 and a high of $416.62 – a Bitcoin price level last seen nearly a year ago. Just 45 minutes after hitting that high, the price of Bitcoin had fallen $39, a 9.38% drop. The Bitcoin price is up about 60% over the past month. 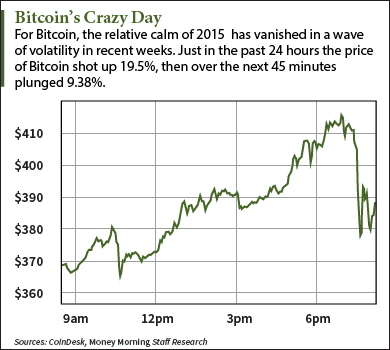 By contrast, the Bitcoin price had spent most of the year bobbing in the $200 to $300 range. While Bitcoin enthusiasts welcome the sudden rise in price of the digital currency, it brings back bad memories of the 2013 bubble. After soaring 8,500% in just a few months, the price of Bitcoin crashed 89%, bottoming out this past January. Whether the current Bitcoin price spike is a reflection of positive trends or a momentum-inflated bubble is debatable. But if you're looking for triggers, they're not hard to find. The first theory, proposed by the website ZeroHedge, maintains that the tightening of capital controls by China's central bank created a surge in demand for Bitcoins. The head of the main Chinese Bitcoin exchange disputed that theory. "Despite what people are suggesting, from what I can tell, it's not a currency controls issue, with people wanting to move RMB out of the country," Bobby Lee, CEO of BTC China, told CoinDesk. "Rather, it's just higher demand for buying Bitcoins, either for payments, speculation, or for long-term holding." Instead, Lee suggested that people had "re-discovered the many positive aspects of using Bitcoin for payments" and pointed to some recent positive Bitcoin news, such as the European Union ruling that Bitcoin is a currency and so not subject to the EU's value-added tax (VAT). Still, it seems a bit of a stretch that Chinese interest in Bitcoin would suddenly skyrocket because of good news out of Europe or a universal "rediscovery" of what makes Bitcoin appealing. But if you're the CEO of China's (and the world's) largest Bitcoin exchange, are you really going to publicly taunt the People's Bank of China by bragging about how people are using your company's services to defy government policy? This much we know: The daily trading volume on China's biggest Bitcoin exchange, BTC China, more than tripled in October from September, from about 20,000 trades a day to more than 60,000. So demand from China is at least a primary factor in the recent Bitcoin price surge. But those positive developments Lee mentioned may be helping boost demand for Bitcoins elsewhere in the world, adding to the heightened interest from China. I'm sure this has been discussed before. But after nearly a year of fairly stable prices I thought I'd look at the correlation between Gold and BTC. I'm comparing two 6 month charts. Seems pretty hard to argue against. Don't they look inversely correlated? Why would this be??? Isn't Gold and BTC both a hedge against Fiat? Why wouldn't they follow one another?